Hotel Red Lion, Prague. Red Lion Hotel Prague. The House at the Red Lion is a romantic style hotel found right on the Royal Route, only 400 metres from the Prague Castle and 500 metres away from the Charles Bridge. The comfortable accommodations include standard double rooms and commodious suites that will comfortably sleep as many as 4 persons. This traditional Renaissance style reconstruction of the house shows unique pieces such as the original painted beam ceilings. There is a magnificent view of Petřín Hill, Royal Route and the Lesser Town rooftops, just below Prague Castle. 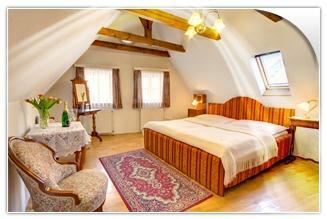 The hotel offers a unique setting with a historic atmosphere, comfortable atmosphere and original furnishings. There is 24 hour reception and concierge service that is available to book tours and excursions around the city, reserve a table at a local restaurant, or get a transfer to and from the airport, railway station or bus station. There is a historical bar, which dates back to year 1350 and is found in a lime stone cellar with gothic vaulted ceilings. Here guests can enjoy a unique atmosphere while savoring one of the local beers or wines. Another comfortable, relaxing are is the patio, for enjoyable times during the day.